When I first read the premise for Inconvenient I couldn't wait to read it, but what I didn't know was how much I was going to love it! I am still left in awe by this book. Once I started reading, I couldn't stop. The author immediately pulls you into Alyssa's world. Once an easy and care-free world slowly turns into a dark and lonely one. The author created such a incredible character cast, each character was so well written and so real. It's very easy to relate to the characters whether it's Alyssa, a young girl that just wants her life to be like it use to be. Or Lana, a teenager with the desire to fit in. The transformations throughout the book are pretty dramatic, every character has one. But the one most obvious and dramatic is Alyssa's. She was taken from her teenage life and was forced to walk down a road that no 15 year should have had to deal with. She reacted with how any real teenager would react...angry. She never sugarcoated a moment when telling us how painful it was to see her mother battle with her addiction and how angry she was at her mother for allowing it to happen. 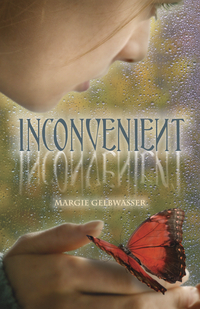 Inconvenient is a beautifully written book, that will have you hooked from the very first page. It is gripping and brutally honest. It is not only a book about a teenager dealing with an alcoholic mother. It is a book about best friends, first loves and self-growth. This is a brilliant book that needs to be added to your 'To be read' piles!